For over 50 years, Dmitry Belyaev and his successors selectively bred wild foxes to make them friendlier toward humans. In essence, they wanted to create a domesticated fox. It began in the Soviet Union during the 1950s. The director of Soviet biology at the time, under the rule of Joseph Stalin, was Trofim Lysenko, a staunch opposer of Mendelian genetics. Under his direction, genetics research was outlawed and became widely viewed as a “fake science”. Two biologists, Dmitry Belyaev and his older brother Nikolay, did not share this view. For them, genetics was a field that held enormous potential. Of course, it was painfully obvious to the two that pursuing research in the area would require them to skirt around the law, but they were undeterred and did so regardless. This boldness, however, came at a high cost when their activities were discovered: Belyaev lost his job, and Nikolay was taken to a labor camp where he lost his life. Despite these incidents, Belyaev persevered. He performed his experiments in secret, claiming he was conducting research in animal physiology. He sought answers to a peculiarity of evolution: why do animals of different species appear to develop similar characteristics as they become domesticated? Charles Darwin made this observation long ago, that domestication appeared to evoke similar changes in animals–changes such as rolled tails, shortened tails and legs, floppy ears, and piebald coat patterns. The puzzle for Belyaev, now, was to find out how it could be that, despite undergoing entirely disparate domestication processes, the same physical changes appeared. He hypothesized that it was a result of selecting for a broad trait, some measure of “amenability to domestication”, which would affect high-level genes that govern both behavior and developmental processes. This, in turn, would result in the physical changes we observe. This would turn out to be a difficult puzzle to solve. Remember–this took place in the 1950s, when genome sequencing was hardly even a concept. Belyaev could not directly examine or compare the genes of wolves and dogs. Instead, he decided to take a far-fetched approach that would span generations–generations of foxes, that is. For the last 26 years of his life, he would be breeding wild foxes in an attempt to manually induce evolution and domestication through an artificial selection process. Through evolution, he thought, he could determine whether this animal–which had never been domesticated before–would undergo the same changes as the others. 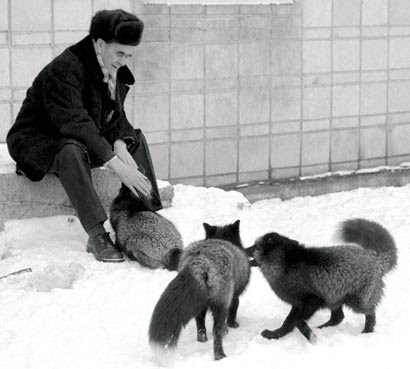 After gathering 30 male foxes and 100 vixens, Belyaev was ready to begin his experiment. 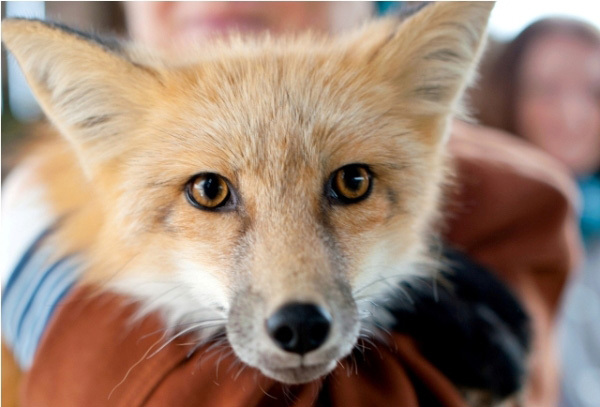 In each generation, he selected foxes based solely on “tameness”, measured through a series of tests of approachability, tendency to bite, and calmness in the presence of humans. Selection was strict–only about 5 percent of males and 20 percent of females were permitted to breed. Foxes were assigned to one of three categories based on their tameness: Class III foxes were the least domesticated, running from experimenters or biting when approached; Class II foxes would appear indifferent to experimenters, neither fleeing nor displaying affection; Class I foxes were friendly toward experimenters, wagging their tails and whining. But changes appeared much sooner than Belyaev had ever anticipated. After just six generations, a new category had to be added to account for the sudden development of even friendlier foxes. Class IE, it was called, was reserved for the “domesticated elite”, foxes not only tame but eager to interact with humans, whimpering for attention and licking experimenters’ faces. Within eight to ten generations, spanning about ten years, the physical changes associated with domestication were already becoming apparent. The foxes had floppy ears, rolled tails, and new coat colors–most notably, a loss of pigment in parts of the body (the piebald pattern) and in some cases, a star-shaped pattern on the face similar to some dogs. Eighteen percent of the foxes at this point were members of Class IE. Another eight to ten generations later, the foxes developed shorter tails, shorter legs, overbites, and underbites. By then, 35 percent were considered elite. Unfortunately, around 25 years into his long-running experiment, Belyaev passed away. Fortunately, Lyudmila Trut, a researcher who once worked under him as a graduate student, was ready to take over. Under her direction, the foxes continued to evolve; 40 generations and 45,000 foxes after the start of the experiment, she now had a special population of 100 foxes, of which 70 to 80 percent made up the “domesticated elite”. With this unique group, she sought to finally answer the original questions set out by Belyaev–what made these foxes develop the same traits as many other domesticated animals, especially given that they clearly did not undergo the same process of natural selection? Trut found strong evidence of Belyaev’s initial hypothesis. It appeared that selecting foxes for domestication resulted in deep-rooted changes in their development processes. But how do development processes elicit the specific physical changes we observe? A good example lies in the coat color of the foxes. As it turns out, mere adjustments in the timing of embryonic development can lead to a loss of pigment in parts of the fur. Let’s see how this works. From the early generations, Belyaev observed that the piebald pattern appeared to be influenced by a gene he called Star, which was also affected by the selection process. What Trut found, years later, was that the Star gene affects the migration rate of melanoblasts. Melanoblasts are the embryonic form of melanocytes. Melanocytes, as their name might suggest, are cells which produce melanin, the pigment responsible for skin color. Melanocytes form in a specific part of the embryo, and then migrate to other parts of the embryo’s epidermis. The migration typically begins when the embryo is 28 to 31 days old. But the existence of a Star gene delays the migration to certain parts of the epidermis by about two days, and this delay often results in death for these late-coming pigment cells. Because of this, no pigment is produced in certain parts of the fur. This is just one of the ways adjustments in development processes can result in physical changes. Evidently, by affecting similar genes responsible for both behavior and development, domestication can result in these physical changes across species. It seems to be an awful lot of progress to go to waste, but this is, in fact, the biggest threat that the experiment now faces. Since the collapse of the Soviet Union in 1991, research grants have been scarce, forcing Trut to make enormous sacrifices. In 1996, she had 700 foxes. Two years later, unable to afford feeding the foxes and paying salaries to her staff, she was forced to cut the number down to just 100. 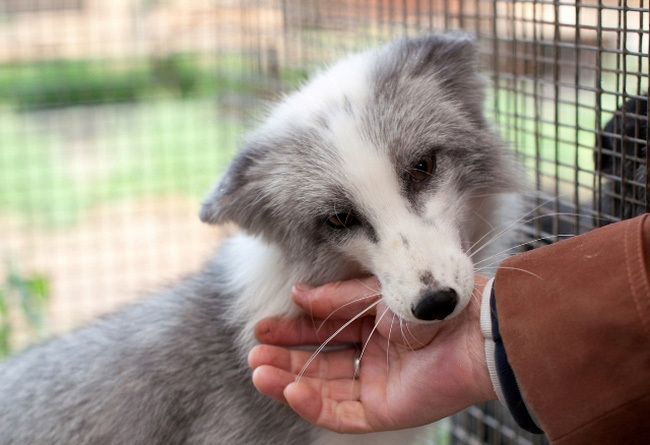 By 2012, seeking alternative sources of funding, Trut has been trying to sell some of the foxes as exotic pets. But even that has not been very successful, with only a handful sold. Without the inflow of resources she needs to keep the lineage going, every year she makes the painful decision of choosing which ones to euthanize or sell off to fur farms. Through their research, Belyaev and Trut have made numerous discoveries about the evolutionary processes of selection and domestication, teaching us a great deal about how animals (and perhaps even humans) developed the traits we see today. But unless a stable source of funding is secured, future discoveries in the area will have to come from somewhere else. “Animal Domestication: Taming the Wild - Pictures, More From National Geographic Magazine.” Accessed March 31, 2013. http://ngm.nationalgeographic.com/2011/03/taming-wild-animals/ratliff-text. Terrill, Ceiridwen. “Guarding the Fox House.” Slate, March 13, 2012. http://www.slate.com/articles/health_and_science/science/2012/03/domesticated_foxes_in_siberia_an_experiment_in_peril_.html. Trut, Lyudmila. “Early Canid Domestication: The Farm-Fox Experiment.” American Scientist 87, no. 2 (1999): 160. doi:10.1511/1999.2.160.